I am bursting with excitement and happiness as I write this post. The International Food Bloggers Auction for Japan closed for bids last Sunday and I just tallied up the highest pledges. We raised $925 for the Japanese Red Cross Woohoo!! Thank You soo much for your generous contributions and to everyone who participated in the auction. And, much gratitude to my fellow bloggers for opening their hearts and busy schedules to put aside some time for this auction!! Everyone accepted without a heartbeat's hesitation and I am so happy we all came together to lend a helping hand. 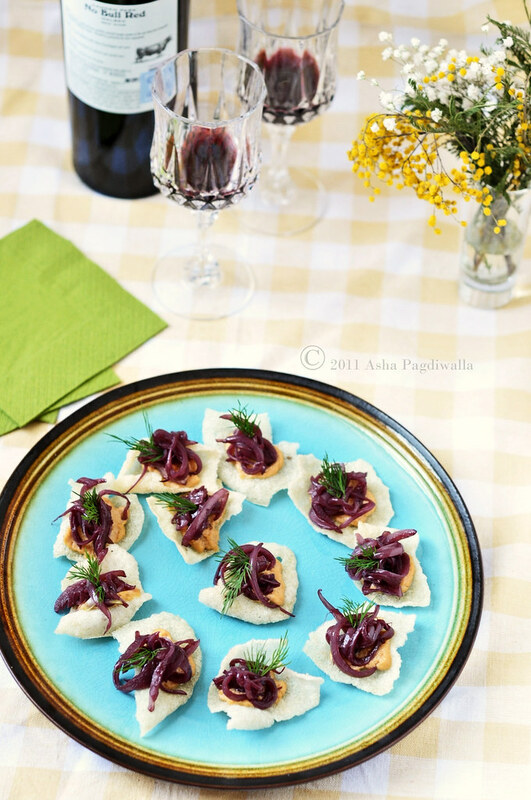 And, to thank you and celebrate this human spirit, may I serve you this graceful and easy-to-put-together appetizer - Rice crackers with Wine Braised Onions over Peanut and Honey Mousse. 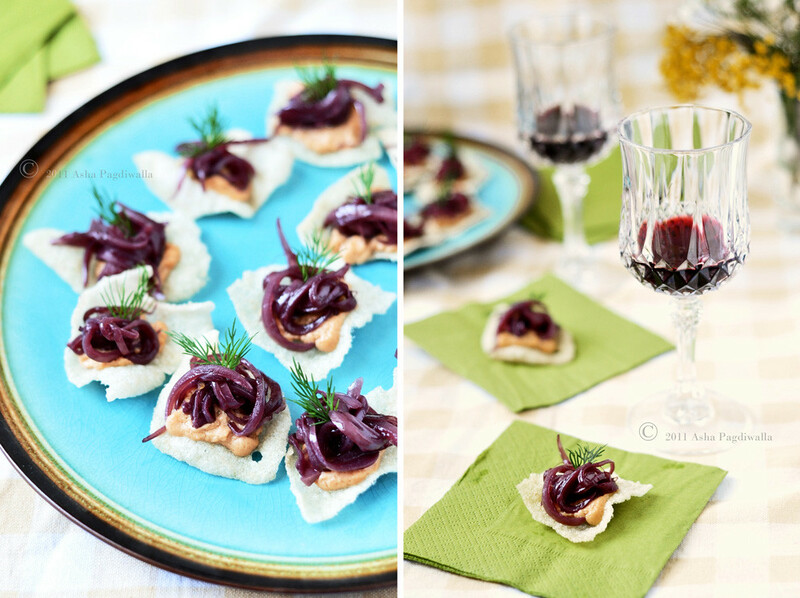 Obviously, this pairs beautifully with bold, full bodied reds. The rice crackers I used are actually appalams from India. Appalams are dehydrated rice crackers that are typically deep fried. They provide an intense satifaction as a side with a simple rice and dal (and a spot of pickle) lunch. They can be easily substituted with any Asian rice cracker. I like the crisp, grainy texture of the rice appalams and that contrasts nicely with smooth peanut mousse and the rich onions. So here is raising a toast to the winners and the Spirit of Japan! Cheers! In a large heavy bottomed pan, heat the oil and add the onions. Saute for a couple of minutes. Add the wine. There should be enough to cover the onions and be a 1/4 inch above the level of the onions. Over low heat, occasionally stir the mixture until the wine has reduced and almost evaporated. Meanwhile, whip peanut butter, cream and honey to a smooth mousse. Refrigerate until ready to assemble. You have to use it very quickly as other wise the fat starts seperating. Fry the crackers just before serving. 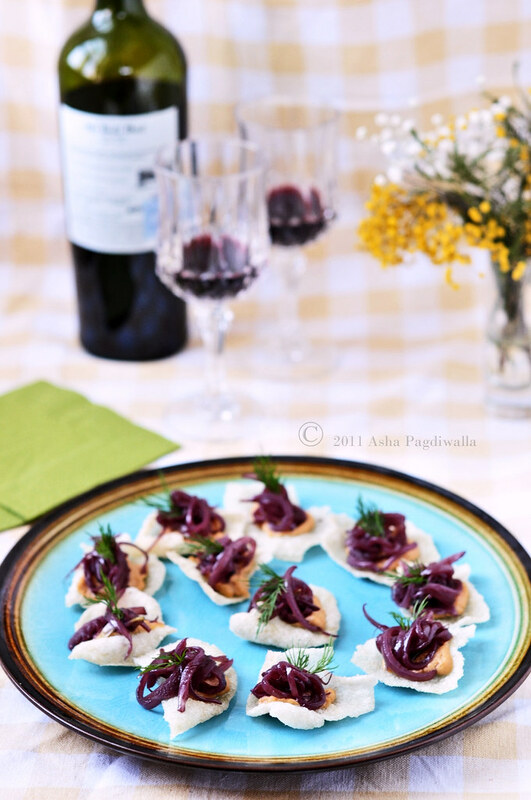 To assemble, pipe a bit of the peanut & honey mousse over the cracker, pile on some onions and garnish with dill. Serve immediately.